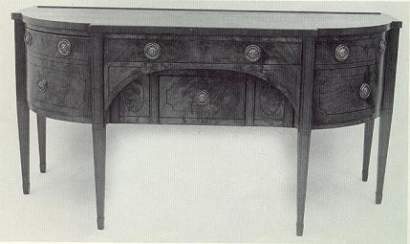 Hepplewhite inlaid mahogany "D" shaped sideboard, having a straight center section with inset rounded corners above a drawer and a recessed door, flanked by bowed wine drawers, each with geometric inlaid stringing, on square tapering legs with spade feet. England, circa 1790-95. 72" long, 31" deep, 38" high.